These parenting quotes were written by parents for parents. As many of you know, and some will discover, being a parent can be hard and challenging work. Feedings in the middle of a sleepless night, tending to a sick child, the terrible two’s, and more, are just some of the challenges parents face. And, it doesn’t get any easier as children age into teenagers and older. But, the rewards are off the charts! Parenting is one of those rare things that seems to get continually better with each passing day. 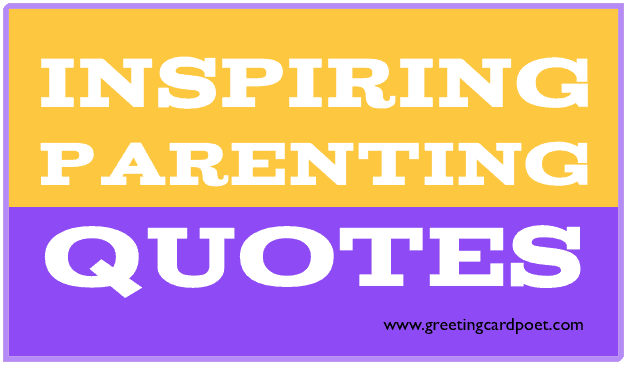 Check out our quotes on parents and see if you find something you can relate to either for your parents or your children. There is no one like your parents. No one can take their place and no one can love you like your parents. Only a parent can shower unconditional love on you. They have the biggest impact on you. It is not the best schooling, but great parenting that makes men and women great. The importance of parenting can’t be overstated. As you review this collection, you may have a greater appreciation for your own parents and other folks going through parenthood. Appreciate your parents. You never know what sacrifices they went through for you. A father’s goodness is higher than the mountain, a mother’s goodness deeper than the sea. Love is giving your kids your undivided attention and time. By the time I realized my parents were right, I had kids that didn’t believe me. A mother’s love is patient and forgiving when all others are forsaking, it never fails or falters, even though the heart is breaking. Teach your children to say you’re sorry and to forgive. Actions are greater teachers than words. You might enjoy our hilarious jokes page. Hostage Negotiator: Another job that’s less stressful than being a parent. Parenting without a sense of humor is like being an accountant without a sense of math. You know you’re a mom when you understand why the mother bear’s poorige was cold. Patience: What parents have when there are too many witnesses. You know your life has changed when going to the grocery store by yourself is a vacation. Step-parenting and being a step-sibling presents a lot of exciting opportunities. When families break up and re-form, there may be less order, less certainty, and a bit more trauma involved, but kids can end up having half-a-dozen parent figures. If I could choose from all the step dads in the world, I’d choose you! Anyone can be a father, but it takes someone special to be a step dad. Step-parenting is like working at a late-night convenience store…all of the responsibility and none of the authority. For better or worse, step-parenting is self-conscious parenting. You’re damned if you do, and damned if you don’t. A single mom tries when things are hard. She never gives up. She believes in her family, even when things are tough – She knows that above all things… a mother’s love is more than enough. I’m a single parent, a working mother, an executive, and an author. My greatest accomplishment will be to raise three wonderful children. The best situation is being a single parent. The best part about is that you get time off, too, because the kids are with their mom, so it’s the best of both worlds. There’s a lot to be said for it. I can understand why a single parent, working two jobs, would find it easier to stop at McDonald’s with the kids rather than cook something from scratch at home. Creating a child takes no love or skill; being a parent requires lots of both. You don’t really understand human nature unless you know why a child on a merry-go-round will wave at his parents every time around — and why his parents will always wave back. What it’s like to be a parent: It’s one of the hardest things you’ll ever do but in exchange it teaches you the meaning of unconditional love. That’s the nature of being a parent, Sabine has discovered. You’ll love your children far more than you ever loved your parents, and — in the recognition that your own children cannot fathom the depth of your love — you come to understand the tragic, unrequited love of your own parents. Your children are the greatest gift God will give to you, and their souls the heaviest responsibility He will place in your hands. Take time with them, teach them to have faith in God. Be a person in whom they can have faith. When you are old, nothing else you’ve done will have mattered as much.